Choose from a variety of wedding invitations that comes with contemporary and elegant designs available at Idea Chic. Great Gatsby Invitation Wedding is a great theme wedding invitation for those who would love to go back in time of Great Gatsby or Art Deco theme. Idea chic offers you customized invitation along with amazing features such as colors, card stock and so on. Idea chic is an online website that is run by a husband-and-wife duo located in Denver, Colorado. The company is best when it comes to delivering creative wedding invitations, gifts, and stationeries using high-quality materials. Located right in “The Centennial State”, Colorado, the company is famous for its high quality, excellent service and speedy delivery. Planning a wedding can be quite enthralling and even more is the wedding invitation. You need to mix the right kind of words that will make your special occasion more memorable. You can customize the designer invitation that will match your wedding colors and mood perfectly thus setting the right kind of tone. Currently, there are two different wedding invitations to choose from the Great Gatsby category. Among many designer templates are Great Gatsby Invitation Wedding Invitation that comes with swirls and a pinstripe border outline. You will also find festive fonts along with an arched art deco envelope liner. The best part is you can customize the invitation as per the wordings/content in the invitation. Choose different colors of card stock – white, ivory or kraft. These background colors are classy and add an elegant look to your invitation. Intricate designs – The designs are eye-appealing and add a grandeur look to the cards. They are intricately cut in such a manner to add an aesthetic appeal and give it a royal feel. The dimension of an invitation is 5” x 7” that comes with coordinating envelope of $2.65 each. You can also choose from a variety of idea chic twine (string) along with a circle tag of 2” for an enhanced look. The envelope liner is also available. Choose if you want to attach a Reply postcard or reply envelope. It will cost you a small fee. What a fun way to host an extraordinary yet intricately designed wedding? The inspiration of The Great Gatsby and opera, this is the right design that delivers not only unique but elegantly styled wedding invitation to welcome your family and friends. The invitation is printed only in 11lb. card stock. You can choose between white, kraft and ivory background. While kraft and white are great, ivory is one of the best selling stock. There are sample colors swatches that will help you to choose. The invitation card dimension is 5” x 7”. Though optional, you can choose between circle tag with twine that adds an elegant yet aristocratic look to your wedding invitation. This great gatsby invitation comes with a blank envelope for your wedding card. You also have the options to include reply postcard, mailing envelope etc. Make sure that you order at least 20 wedding invitation. The company also provides you the liberty of customizing your own fonts and paper color – ivory, kraft or white. Always make sure to spell check to avoid any errors. You can also download idea chic wedding catalog that will guide you on how to go about with the invitation details. Before finalizing, make sure you “Spell Check” to correct any errors. Of course, as a safety measure, Idea chic will send you a digital draft version within 48 hours after making the order. If there are any rectifications, the company will fix the issue and send you a draft. Only after your approval will the order will be forwarded for printing. Each invitation is designed with unique fonts that blend efficiently with the overall look and style of the invitation design. Upon request, Idea chic will forward you the list of fonts so that you can customize the wedding invitation at your discretion. 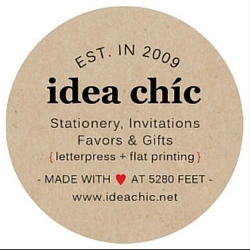 There are many blog reviews dedicated to Idea Chic invitations and stationeries. People love the quality and the way the company makes the user feel special. Users claim that they find cute “thank you” note along with their invitation orders or subscription. From calendars to subscription boxes to postcards, you will find many products at idea chic that comes with myriad designs that suit people’s mood and style. The price is budget-friendly and does not drain your pocket. This is what makes people come back to idea chic again and again. Idea chic offers FREE SHIPPING anywhere in the USA. Idea Chic products do come with 30 days return policy. You can return unused, damaged or defective items by returning them ASAP. The company will offer you reimbursement upon perusal. The shipping fees will be deducted from the original payment. However, NOTE that perishable products such as tea, coffee, mulling spice, cider, trail mix or cocoa is exempted from returns. Bottomline, Great Gatsby is one many selective choice of wedding designs for you. Idea chic has excellent innovative designs and customized fonts will make the best day of your life memorable in every which way.